John McCall MacBain graduated from McGill in 1980 with an Honours Bachelor of Arts degree in Economics. During his time at McGill, he was deeply involved in university life, including serving as President of the Students’ Society of McGill University, as well as a Senator and Governor, and was ultimately named Valedictorian of his class. He subsequently obtained a law degree from the University of Oxford as a Rhodes Scholar, followed by an MBA from Harvard Business School, before launching a successful entrepreneurial career as founder of Trader Classified Media. Dr. Marcy McCall MacBain holds degrees from McMaster University and the London School of Economics, as well as a DPhil from the University of Oxford, where she is a Senior Research Fellow with the Department of Primary Care Health Sciences and collaborator with the Centre for Evidence-Based Medicine. Dr. McCall MacBain is a member of the Geneva Committee of Human Rights Watch and is on the board of B2ten, an organization supporting Canadian Olympic athletes and physical literacy in youth. 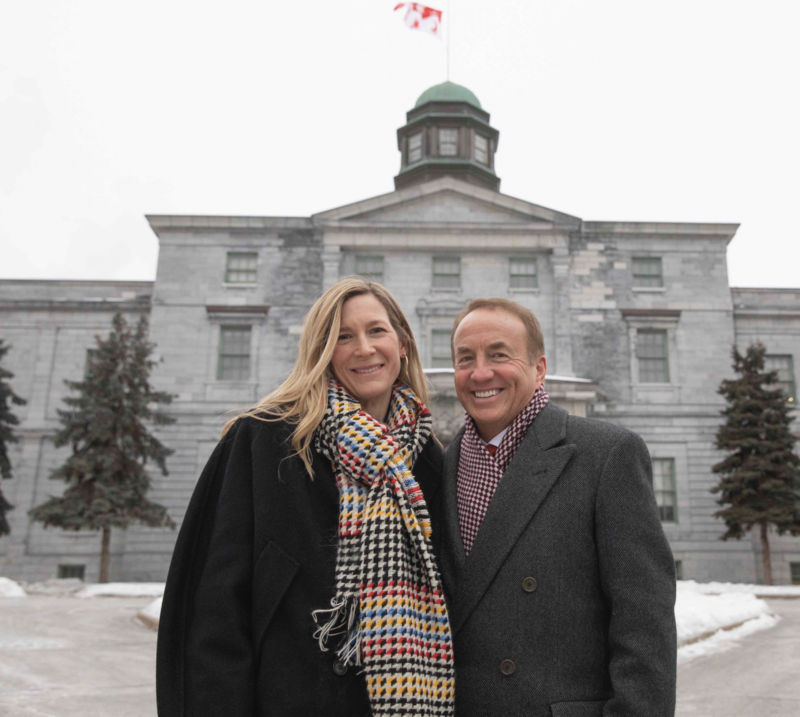 In February, the McCall MacBain Foundation made a historic $200-million gift, the largest single gift in Canadian history, to create the McCall MacBain Scholarships, which will provide outstanding students from Canada and abroad with the opportunity to pursue a master’s or professional degree at McGill, combined with a comprehensive enrichment program. The driving goal of the scholarships is to enable recipients to develop skills and qualities that will position them to become leaders with greater capacity to advance global understanding and improve human welfare throughout the world. In 1839, construction began on the iconic building that is now home to McGill University’s Faculty of Arts. Initially known as the McGill College building, it became known as the Arts Building as the school evolved into McGill University. The first iteration of the building was completed in 1843, and numerous modifications were made over the years. The recognizable Arts Building façade known today was completed in 1862 with the addition of Molson Hall, a west-wing extension named for early benefactor William Molson, along with a connection to the building that is now its east wing. Once known simply as “the wing”, this building was named Dawson Hall in 1947 for Sir John William Dawson, McGill’s fifth principal, who was instrumental in developing McGill’s standing and improving its downtown campus.